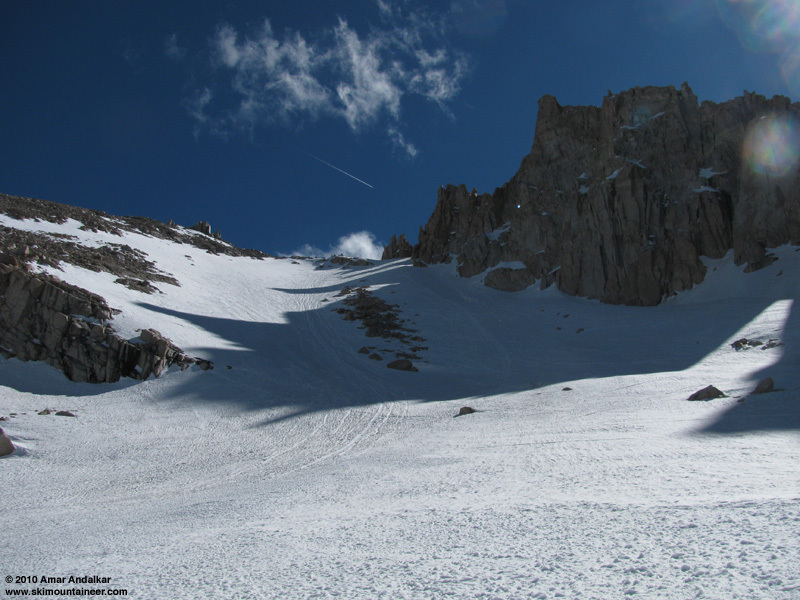 June 4, 2010, Mt Whitney, Trail Route Ski! 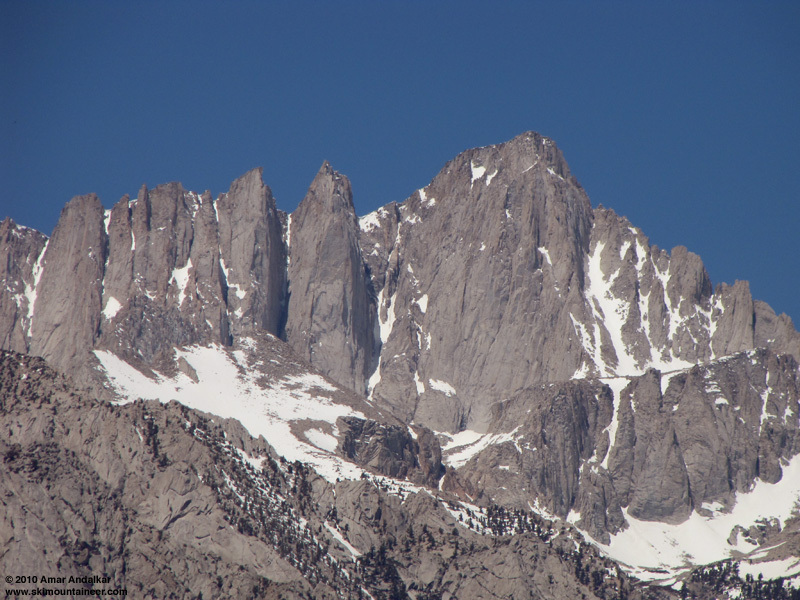 Intro: Mount Whitney, the highest point in the lower 48 at 14505 ft (4421 m), has a reputation for being not much of a ski mountain. A vertical granite east face, combined with a nearly-flat, gently westward-sloping summit plateau scoured by high winds, make the ski terrain less than ideal. The one route that is reputed to be worth skiing is the Mountaineers Route, a prominent couloir through the east face which climbs to a notch near 14200 ft, followed by a steep (often dangerously icy) climb of a chute up the north face to the summit. 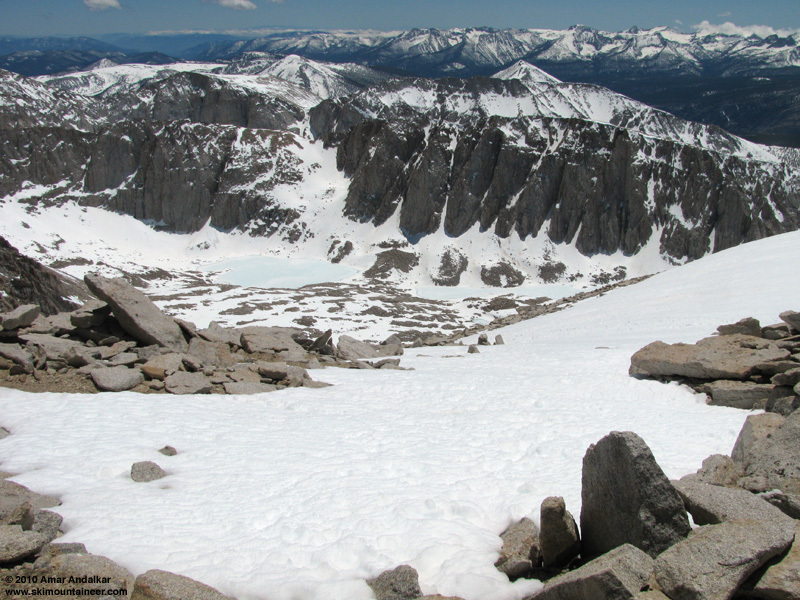 With deep snowpack and good timing, this route can be skied from the summit. Telephoto view (560 mm zoom) of the east face of Mount Whitney from Lone Pine, with the Mountaineers Route just right of the summit. There's no way that I was walking up hundreds of feet of bare scree to and from the summit to ski that. Instead, I would take a chance and try skiing the regular trail route, which few people try to ski and which I could see none of from US 395 . . . but it worked out great! In the right conditions with a good snowpack, it's certainly a worthwhile ski route. This time, it provided 4000 vert of ski descent, and skinning up greatly reduced the effort on the ascent too. And shockingly, I was the ONLY skier on the entire mountain among hundreds of hikers on foot, on a glorious sunny warm day. Details: I'd left Seattle on Sunday, May 30: faced with a forecast for a week of rain, I was desperate to escape southward into sunshine. The unusually strong and persistent upper low in the Gulf of Alaska kept pushing clouds and rain farther south along the West Coast during the Memorial Day weekend and the first days of June, across northern California and even past Lake Tahoe into the Mammoth Lakes region. My continuing efforts to stay in the sunshine forced me to drive south more and more. Diamond Peak, Medicine Lake Volcano, Alpine Meadows, and Mount Dana had ended up being my largely unplanned ski destinations on the first four days of the trip. Each time being lucky enough to skin right from car to summit and ski back down, often with clouds and thunderstorms all around, but never quite getting wet during the trips. The first two nights, though, I was awakened before dawn while sleeping in the car, by the sound of large raindrops clattering on the roof. This was certainly not a typical spring anywhere along the West Coast. 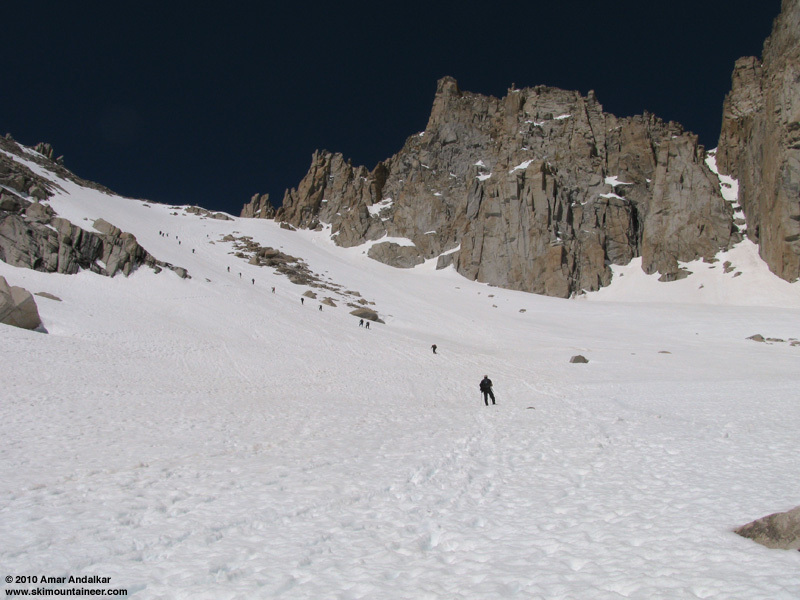 After skiing Mount Dana in Yosemite on June 2, I planned to ski Mammoth Mountain ski area on Thursday June 3, followed by an attempt to ski Mount Whitney on Friday June 4. But a forecast of "mostly cloudy" for Thursday in Mammoth, combined with the minimal lifts open midweek (only 3, and not to the top, for $69! ), nixed the ski area plan. So onward I drove, south to Lone Pine to get a day hiker permit when they become available at 11 am at the Interagency Visitor Center. The Mount Whitney permit system is onerous and strict (although thankfully free): a maximum of 100 day hikers per day, plus 100 overnighters, and most permits are reserved far in advance in February -- the only reasonable chances of getting a walk-up permit are before early-June or after late-September, but they are slim to none during the peak summer season even midweek. But I knew there were still enough day permits available for Friday, and soon I was all set. 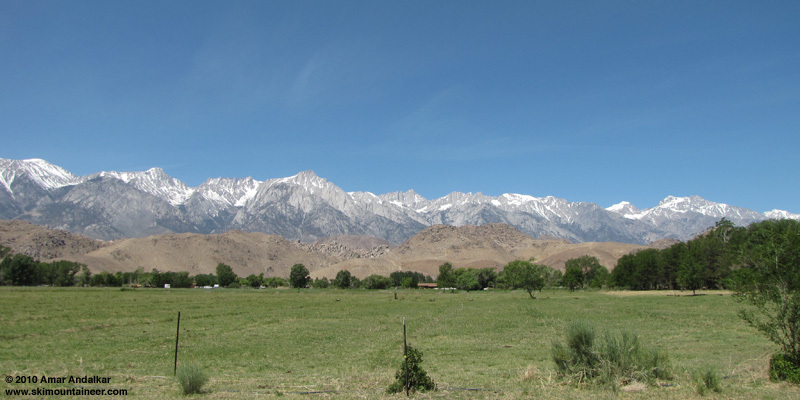 Wide-angle version (28 mm) of previous photo, showing the Eastern Sierra from Lone Pine with Mount Whitney barely noticeable at center. I pondered at length whether I should even bother bringing skis, or just leave them in the car and hike the regular Whitney trail route. I had hiked this trail in late September 2003, a 22-mile round trip with nearly 7000 vert of gain, counting the numerous ups and downs along the final 2.5 miles of the John Muir Trail which traverses from Trail Crest (on the border of Sequoia National Park at 13600 ft) northward to the summit. 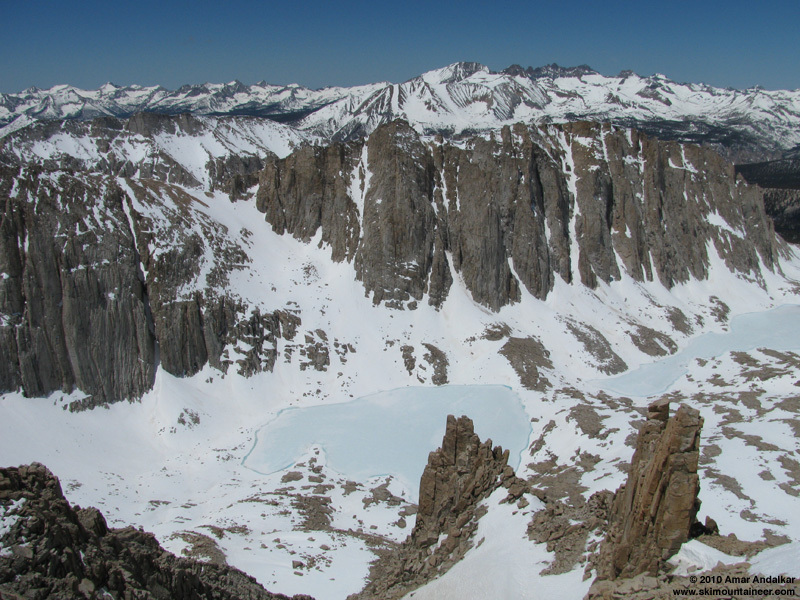 At the time, I had thought that it was the most beautiful day hike I had ever done, a veritable wonderland of vertical granite faces and spires, alpine lakes, and forests of lovely foxtail pine, a rare relict species which is the closest relative of the better known bristlecone pines. 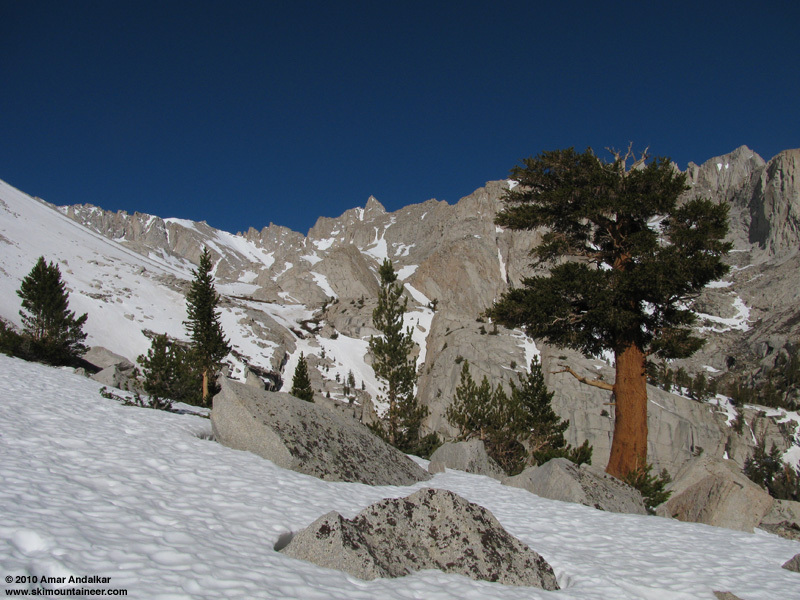 A spectacular specimen of foxtail pine at nearly 11000 ft along the Mount Whitney trail. The conditions report from May 27 revealed that the trail route still had continuous snow to within 1.5 miles of the Whitney Portal trailhead (8300 ft), down to about 9500 ft. And the ranger writing up my permit told me that her colleague who wrote the report had actually skied the trail route from Trail Crest on May 27, so my confidence grew in bringing skis. At this time, now a week later, I figured it would still be possible to skin from snowline near 10000 ft all the way up to Trail Crest at 13600 ft, then hike the trail along the crest to the summit, and hopefully ski another section along the west slope from near the summit, if there was any snow left up there. That would be my plan. With permit in hand and still barely noon, I had lots of time to kill before driving up to Whitney Portal to car camp for the night. Might as well go to Death Valley National Park, only a quick 100-mile jaunt east of Lone Pine, especially since it was the first REALLY hot day of the year: temps were already over 90 �F in Lone Pine at 3700 ft at noon, so I hoped they would exceed 110 �F once below sea level in Death Valley. I was not to be disappointed: the official temperature at Furnace Creek visitor center (-190 ft) was 110 �F (43 �C) at 3pm, and my car thermometer display often exceeded 115 �F as I drove along the scalding highways through the park, topping out at 118 �F. 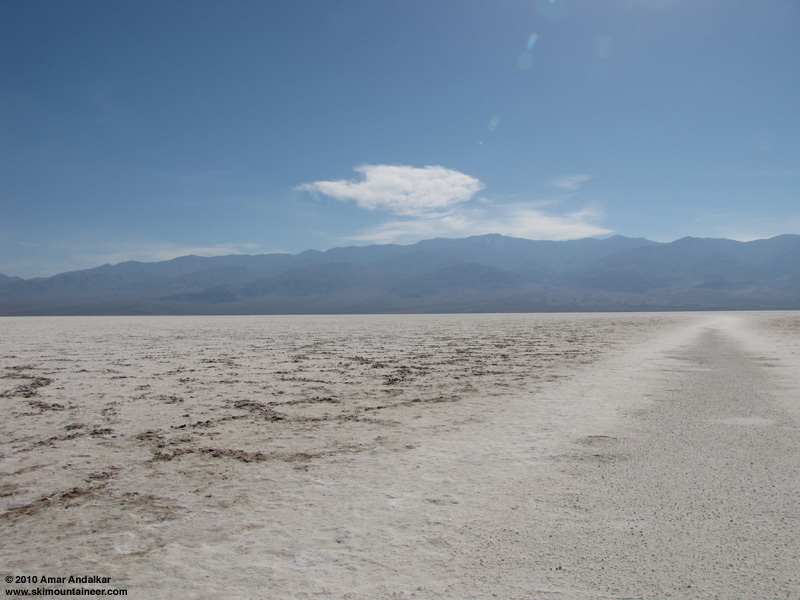 I reached Badwater by 4pm, at -282 ft the lowest point in North America, and headed for a hike out across the salt flats. The withering heat soon stopped the numerous other tourists, and within minutes I was all alone far beyond them. The water in my bottle soon warmed to an unpleasant temperature, but I drank it anyway out of necessity, with my OR Sun Runner hat and a welcome breeze providing the only relief from the intense broiling heat. Fifteen minutes and over a half-mile out from the car was more than enough, so I turned around -- I was ready to ski Mount Whitney. The broiling salt flat of Badwater at -282 ft in Death Valley, with 11049 ft Telescope Peak rising beyond. 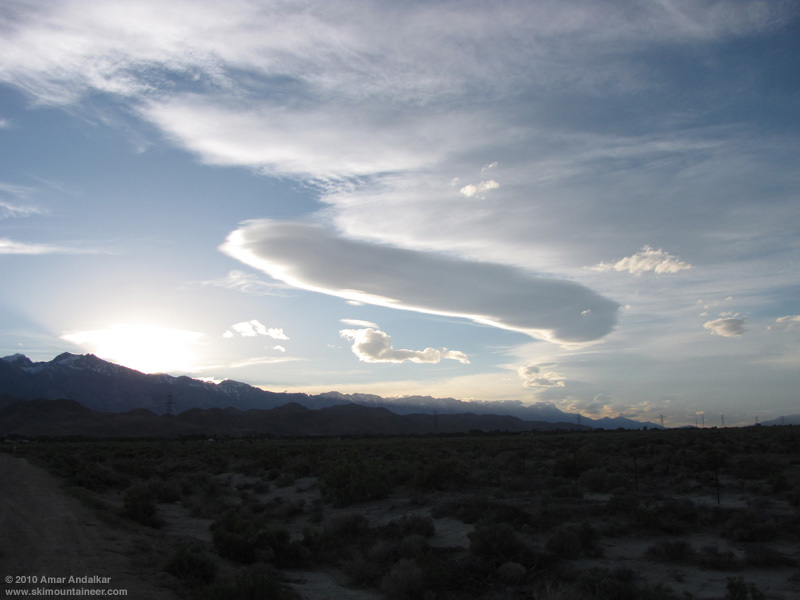 Sunset on the drive back to Lone Pine, with a spectacular Sierra Wave cloud hovering along this portion of the crest, and numerous lenticulars visible farther north. 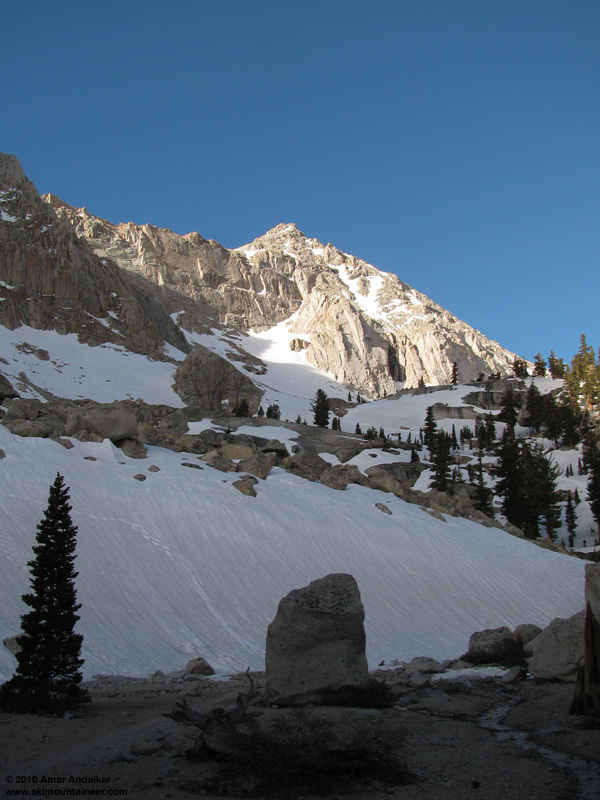 I arose at 5am the next morning at Whitney Portal, with temps at a comfy 59 �F, and hit the trail just after 6am. Most day hikers had left by headlamp around 2-3am, planning on 9-12 hours one way to the summit. I had made it in 6 hours in September 2003, and hoped to match that today, despite carrying the additional 18 lbs of skis/boots/skins on my pack this time. The freezing level was forecast to be about 18000 ft, so I knew that the snow would be thoroughly cooked and over-softened no matter how early I left, so I might as well sleep-in until sunrise and hike by daylight. 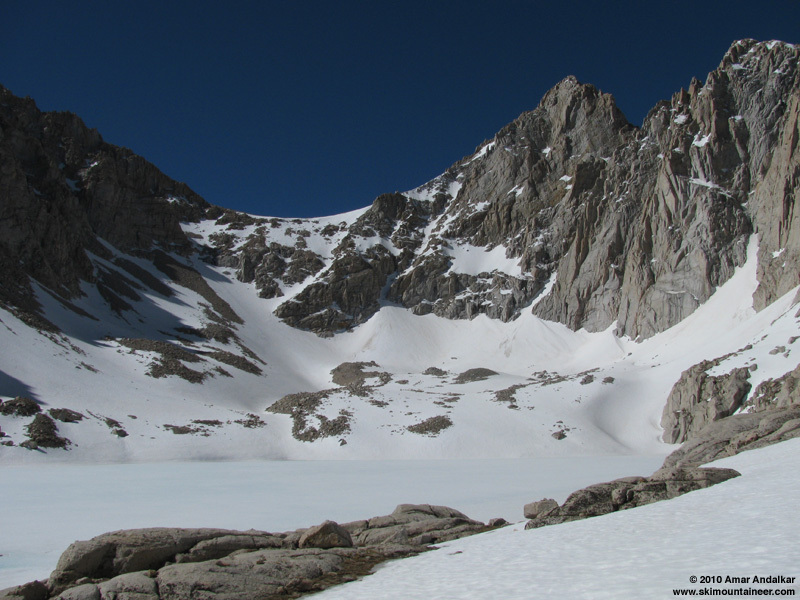 The continuous snow begins at Lone Pine Lake junction, 10000 ft.
Reached the first snow patches around 9500 ft, then switched from hiking boots to ski boots and skinned from 10000 ft at the Lone Pine Lake junction (2.5 miles out). By initially staying well left of the discontinuously buried trail and instead sidehilling the north facing slope which bounds the basin, I managed to stay on continuous snow (just barely in spots) all the way to Trail Crest at 13600 ft. I was quite surprised to be the only skier among the 200 permitted hikers: this was definitely NOT the Pacific Northwest. Still-frozen Consultation Lake at 11680 ft, nestled in a magnificent granite cirque with a small rock-covered glacier visible beyond. The hikers were all postholing shin-to-knee deep as the snow softened in the increasing sun and heat, with occasional crotch-deep stumbles through the surface layer into the isothermal mush below. In sharp contrast, it was easy and swift travel on skins, moving 2-3 times as fast as any hiker as I passed dozens of them. Made a few large switchbacks up the steep 35+ degree slope to Trail Crest, as the postholers wilted in the reflector-oven heat of late morning. A train of post-holing hikers struggling up the steep slope towards Trail Crest. Reached Trail Crest just after 11am, then took a long break to melt more snow on the Jetboil and switch back to hiking boots. I would need to carry the skis and ski boots for the remaining 2.5 miles to the summit. 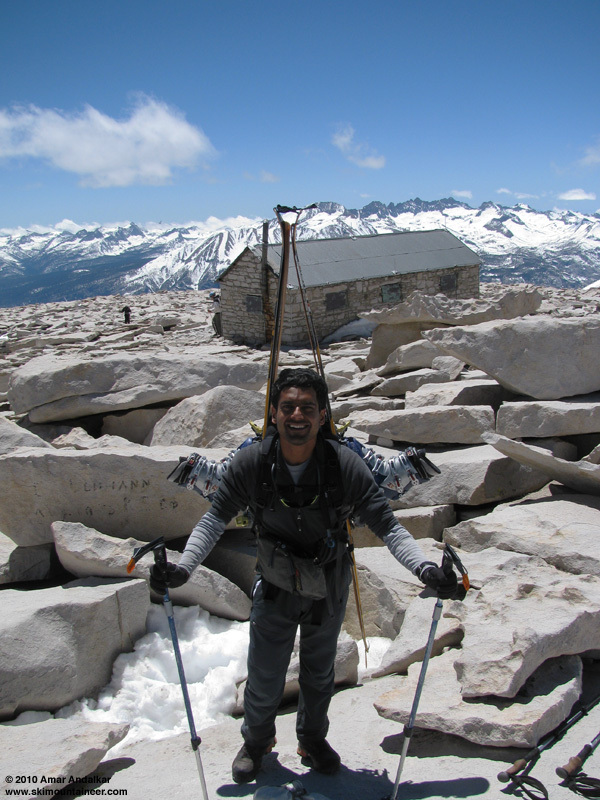 The trail drops 200 ft to join the John Muir Trail, which then follows a steep west-facing sidehill blasted out from the granite spires along the ridge to the summit, and I knew it would be mostly bare. Looking down from Trail Crest at the NE face of 13186 ft Mount Hitchcock, with the twin Hitchcock Lakes below at about 11700 ft.
After much too long of a break, I was back hiking at noon, my pace slowing greatly with the extra 18 lbs of burden once again. As expected the trail was mostly bare, quite rocky, and very exposed in a few spots above cliffs, and I was glad not to be hiking in ski boots. The first major snowfield was reached near 14000 ft on the SW face, and I could see that this would offer worthwhile turns on the descent, even though not worth switching everything back to skin up it. The snow ran out at 14300 ft, and from there it was more bare trail, weaving through the rounded man-size granite boulders which form the talus atop Whitney's summit plateau. 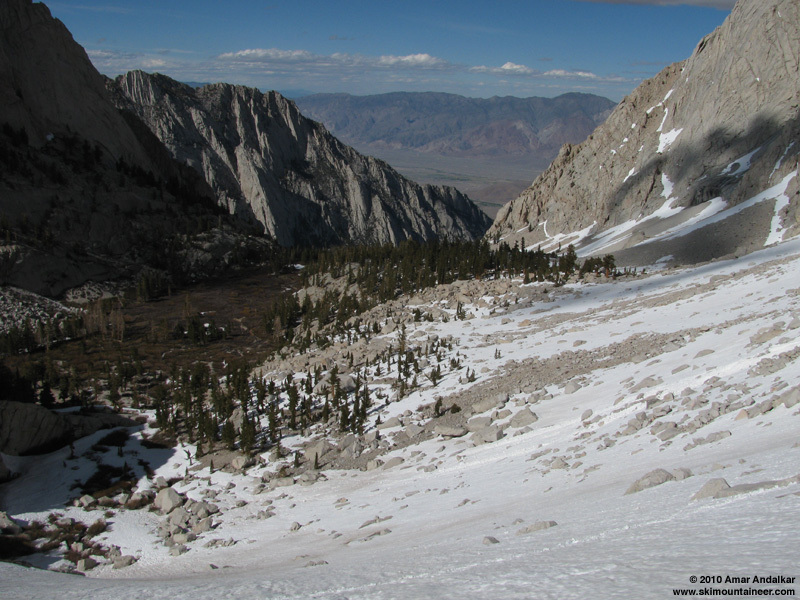 Looking north towards the summit of Mount Whitney from the long trail traverse, showing the still-skiable southwest slopes. Reached the summit at 1:30pm, in brilliant sunshine and very light winds, just a breeze about 5 mph. 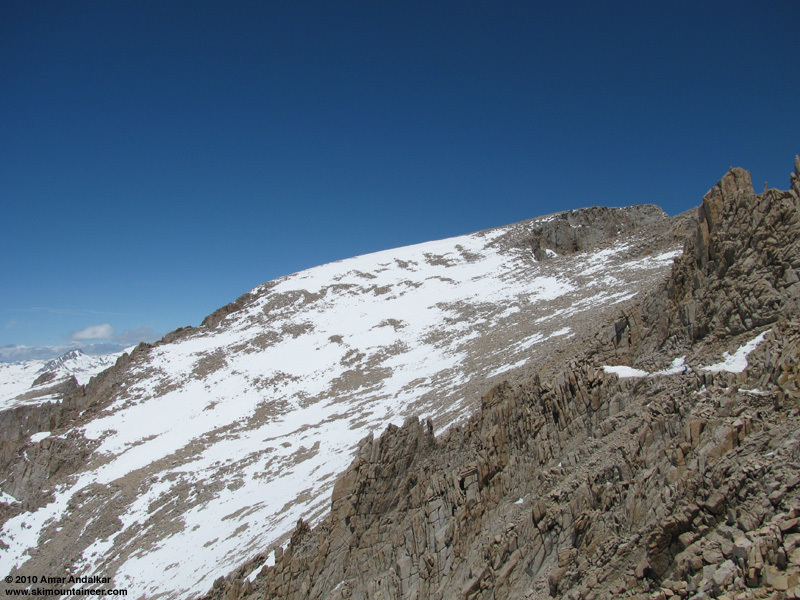 A few patches of snow could be found in depressions among the boulders, along with a modest snowdrift along the NE wall of the large stone summit hut, the Smithsonian Institution Shelter. Otherwise, as expected, the summit area was bare of skiable snow and had been so for quite some time, perhaps several weeks. Skis at the summit of Mount Whitney, with the Smithsonian Institution Shelter behind. After a half-hour on the summit, I hiked back down the trail to 14300 ft and put the ski boots back on. Skied from 14300-13900 ft down the SW face, carving deep trenches on totally oversoftened snow, and even managed to hit a few rocks that were hidden many inches (or even a foot or so) below the surface. Ready to ski at 14300 ft, looking down the southwest slope towards Mount Hitchcock and Hitchcock Lakes. Could have continued down another 500+ vert if desired, but given the snow conditions it hardly seemed worth it since any descent below 13900 ft would have to be regained on skins. From here though, with another switch to hiking boots, it was simple to hike a short horizontal traverse through the boulder fields to rejoin the trail, followed by the better part of an hour hiking the 2 miles back to Trail Crest. Back on with ski boots and skis, then finally skiing the main course from 13600 down to 10000 ft. Decent corn on the steep 35+ degree NNE-facing slope from 13600-12500 ft, even now after 4pm, then oversoftened mush below that, but still SO much better on skis than on foot. Looking back up the slope towards Trail Crest, ski tracks faintly visible at left. Below 11000 ft, where snow coverage was thin atop the rocky talus and much melting had occurred during the hot day, it was time to do a lot of weaving and routefinding. Luckily, some wet slides which had released earlier in the afternoon on the north aspect had actually increased the snow depth in one of the rockiest spots, making for easy travel back across the avy covered talus. Looking down the last part of the ski descent from near 11000 ft, with the helpful wet slides visible at right. 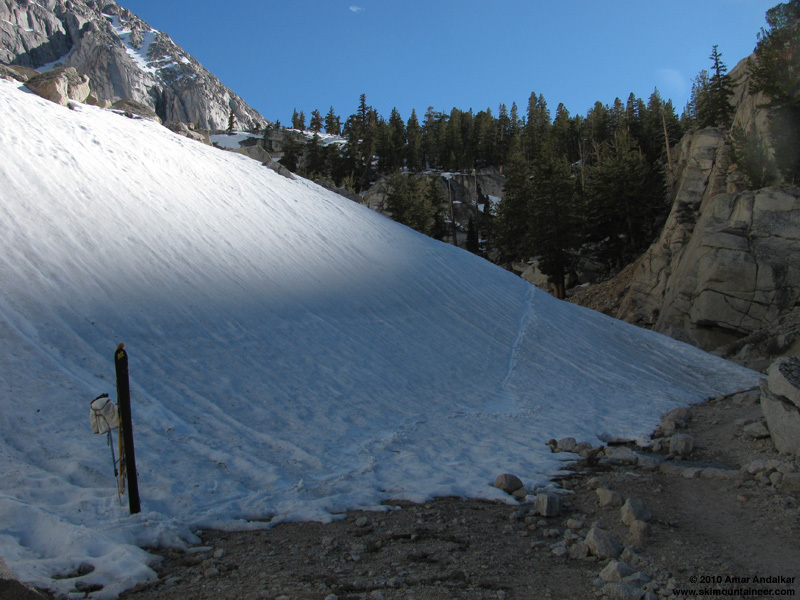 I reached the end of the snow at Lone Pine Lake junction just as the sun was leaving the slopes, around 5:15pm. A final switch to hiking boots (the SIXTH boot swap of the day) and an easy hour's hike brought me back to the trailhead by 6:30pm, elated with another spectacular ski day. The end of the ski line, back down to Lone Pine Lake junction at 10000 ft.
What a strange and amazing trip to the roof of the lower 48, less than 24 hours after visiting the lowest point on the continent! A total of about 18 miles roundtrip, much shorter than the full 22-mile trail since the roughly 100 switchbacks up to Trail Crest were buried by snow. And almost 7000 ft of total gain. Taking just over 12 hours roundtrip, but about 2 hours of that was spent in the six ski/hiking boot transitions. With the surreal experience of being the only ski mountaineer among 200 hikers. Not to mention skiing on a day with an 18000 ft freezing level, easily the highest I've ever had on a ski trip. But best of all, it had been completely worthwhile to bring skis, avoiding the miserable deep postholing that all the hikers endured and even ending up with about 4000 vert of ski descent out of the net 6200 ft elevation difference from trailhead to summit. Not a bad ratio at all on a "non-skier's mountain" like Whitney. I'm sure I'll be back again someday, and unless it's nearly snow-free in summer or fall, I'll be bringing my skis! Hopefully I'll get there early enough in a fat snow year to ski from the top next time. Re: June 4, 2010, Mt Whitney, Trail Route Ski! Another outstanding (and unusual) report - congratulations! Great TR and photos. Jill and I love the Eastern Sierra. I wonder about those couloirs between the Needles in your telephoto shot. Does the snow extend all the way to the base of them, or do they cliff out? I was thinking the second couloir, between Keeler and Day, although a quick glance at the map makes the one between Whitney and Keeler look more realistic (I think the upper reaches are hidden in your photo.) Could be an "interesting" variation to the mountaineer's route. Cool trip to a beautiful area.